Fiestas Patrias, popularly known as "el Dieciocho", is the National Day which takes place in Chile every 18 September, depending on what day of the week the date falls, the celebrations can also include from 17 to 20 September. What it is actually commemorated is the creation of the First Government Junta on September 18, 1810, the first autonomous form of government emerged in Chile. The next day (19th) is celebrated "The Day of the Glories of the Army", with a Military Parade that takes place every year in the O'Higgins Park of Santiago, in the presence of the highest authorities of the country and people in general. Without a doubt, the Fondas and Ramadas are the most popular meeting places to commemorate Fiestas Patrias. These venues are a kind of improvised restaurants, especially decorated for the occasion, usually with branches or leaves of typical trees and where the birthday of the country is celebrated enthusiastically. 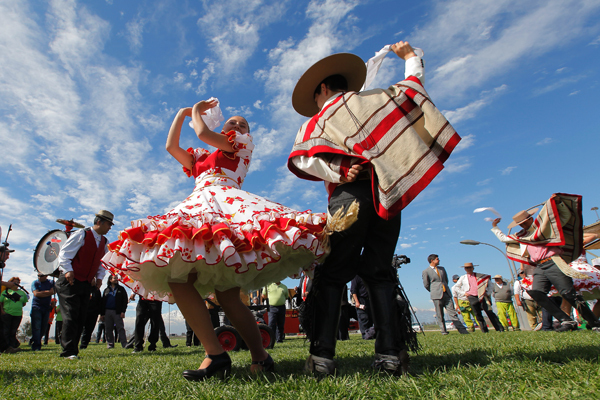 The "Cueca Chilena" is the main protagonist of all celebrations, since it is the National Dance. 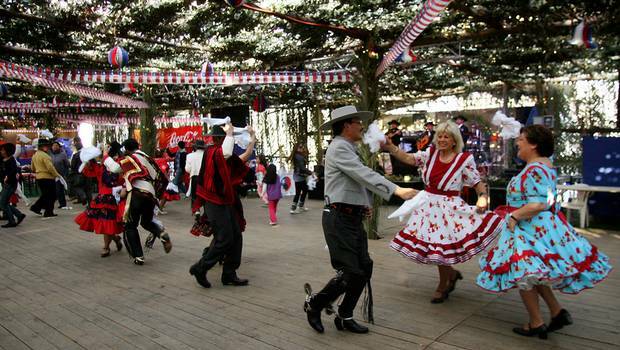 In addition to the typical Cueca of the central zone of the country, there are other variants such as the "Cueca Chilota", "Cueca Nortina", "Cueca Brava", "Cueca Chora" which is especially identified with the seaports of Central Chile, etc. But all have the common feature of being very lively and festive. During these festivities as well as in all the folklore presentations you can see many people dressed as "Huasos" (countryman of the Central Zone) and "Chinas" (female Huaso) with their typical dresses dancing the Cueca. Also in these celebrations other dances are also popular such as the Cumbia ("imported" from Colombia, Panama, etc.) and other tropical sounds like the Salsa and even Mexican "Rancheras", very popular in Chile as well. As for gastronomy, the Chilean "Empanadas" are the most famous and traditional food. It consists of a dough either fried or baked stuffed with ground beef, onion, raisins, boiled egg and an olive. Also famous are the "Cazuela de Ave", a very filling chicken or hen soup, the "Anticuchos" ( Chilean style Brochettes) with beef, chicken, sausage, chorizo, onions, peppers besides the Chilean Roasts, Barbecues and the Choripan, a combined word to describe a chorizo in a piece of bread. Apart from the different types of wine, of which Chile is a major producer, the most requested drinks by those attending the Fondas and Ramadas are the Chicha, the Vino Pipeño (special kind of wine fermented in barrels), the "Terremoto" (Earthquake) a drink prepared from Pipeño wine, pineapple ice cream and grenadine, invented shortly after the earthquake in Chile in 1985. Its name refers to the effect produced after drinking it...., even another drink is the "Replica" (afterschock). Another activity within the National Day (18 September) is the Te Deum, liturgy of Thanksgiving which takes place at 11.00 AM at the Metropolitan Cathedral of Santiago, with the presence of the highest authorities of the country, led by the President of the Republic. On September 19th is celebrated the Day of the Glories of the Army, with a great Military Parade in the Ellipse of O 'Higgins Park. 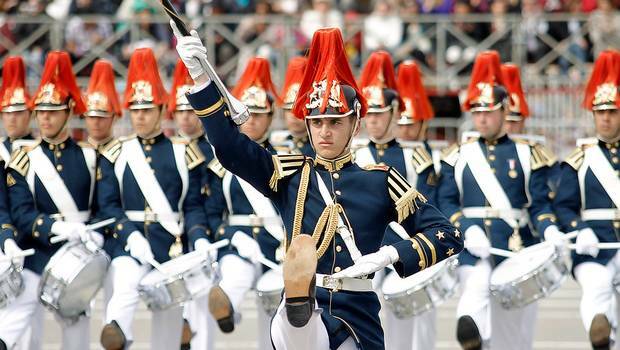 Chile is a country that stands out for having very disciplined and professional Armed Forces, and although this day was established in 1915 to commemorate the glories of the Army, military parades in Chile have been a tradition since 1832. That day (19th), the Army receives the homage of the rest of the armed institutions: Fuerza Aerea, Armada and Carabineros de Chile, with the presence of invited delegations of neighbors and friendly countries. There is also fun for the family, in many schools are organized fund-raising events known as the Kermeses in Parks and Avenues you can also you see the children raising their kites, taking advantage of the spring breeze that is already coming. Another traditional activity of this period, which for decades has been considered the National Sport, is the Chilean Rodeo (although lately has been questioned by the animal abuse that this sport might imply). This traditional activity is practiced in Chile since colonial times, so it is considered among the most typical Chilean festivities, at least of the Central part of the country. Another Chilean typical game, especially at this time of year, is the "Rayuela", which consists of throwing metal circular discs towards a stringline placed across the width of a small clay square.